"Jumbo Machinder is the name of a series of large-scale plastic robots sold by Bandai's character toy subsidiary, Popy in the 1970s. Although a trademarked brand name, in common usage Jumbo Machinder is often applied to any large-size robot toy roto molded out of polyethylene terephthalate (PET), a sturdy plastic also used for shampoo bottles. Jumbo Machinders are generally (but not always) 24" in height. 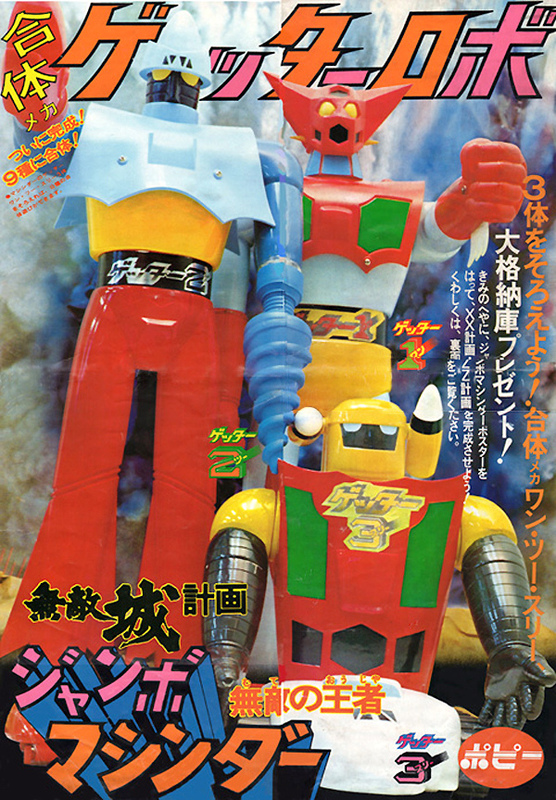 After Popy's success with the Jumbo Machinder series, several other Japanese companies, including Takatoku, Nakajima, and Clover began producing large-size plastic robot toys as well. Several of the Jumbo Machinders were retooled for sale in the USA in the late 1970s as Shogun Warriors. The first Jumbo Machinder, released in 1973, was a portrayal of manga artist Go Nagai's character Mazinger Z, a fictional Super Robot. Originally planned to stand a meter (roughly three feet) tall, the toy was scaled down out of safety concerns. The Jumbo Machinder Mazinger Z sold approximately 400,000 units in its first five months in stores. The second Jumbo Machinder was Kamen Rider V3, the third Ultraman Taro, the fourth Red Baron, and the fifth Kamen Rider X."